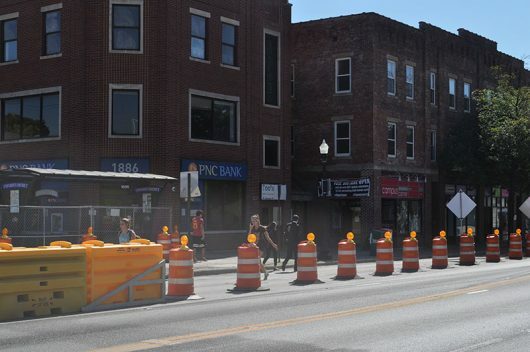 For some Ohio State students and graduates, the changes happening on North High Street — such as the closing of Bernie’s Bagels and Deli, Chumley’s planned move to West Ninth Avenue, the impending closures of Too’s Under High and The O Patio and Pub — are the end of the world. But David Kellough has seen it all before. Though Kellough’s day job as a researcher at Ohio State’s College of Medicine focuses on moving science forward, his off-the-clock work is focused on taking a step back in time, as the University District’s unofficial resident historian, although he might dispute that title. He’s been doing just that on his website, UnivDistCol.com, since about 2006. He’s since expanded onto Twitter, Tumblr and Facebook. Kellough, a University District resident, collects his stories mostly from public records, photographs and news clippings he can find at the Ohio History Connection or the Columbus Metropolitan Library. He takes time on Saturdays to see what he can dig up. “The one constant on High Street is that there’s always been change,” he said. Long’s Book Store, set to be demolished in October, was opened in 1912. Before the 1920s, North High Street was mostly residential. In the ’60s, the area around East 13th Avenue and North High Street was “the mecca of counterculture,” and in the ’70s, unrest led to riots, some of which were carried out on North High Street as well, Kellough said. Kellough also said he sees parallels between the demolition of the old South Campus bars, which made the way for Gateway, and the impending 15th and High development, which is also displacing bars. But Kellough also said that romanticizing the past can be misleading. And while those bars are gone now, that “churn-through” of businesses affects every graduating class. Kellough said his main concern about the 15th and High development is the unanswered question of whether the new retail spaces are filled with local businesses. “They’re talking about the Wellington … the ground floor is going to be a Target. I can’t see anyone having fond memories of the campus Target,” he said. Target, as well as the NPR-affiliated radio station WOSU, are the first two businesses to have claimed retail and office space in the area of the new development. For all the neighborhood’s change, however, Kellough said some things have more staying power than others. Correction, Sept. 22: In an earlier version of this article, David Kellough’s website was mispelled. The website address the article UDHistCol.com is incorrect. What is the correct one?